This shop has been compensated by Collective Bias, Inc. and its advertiser. All opinions are mine alone #GiftingAudio #CollectiveBias. Christmas shopping for a teenage boy can be challenging. My son is 16 and has grown out of toys, has all the video games that he could ever want, and owns more clothes than I do. So what exactly do you buy a 16 year old boy for Christmas? Christian [that's my son] has really grown to be a huge audiophile. He's very into music. Both listening and playing. He plays saxophone, trombone, and trumpet. I know he's going to end up being a band teacher. Needless to say, music is his life. He's incredibly talented and I'm so very proud of him. This boy of mine has become so snobby about the technology that delivers his music to him. He even chose which cellphone he wanted based on the speakers and audio quality. It was a whole debacle of research! So what do you get the audiophile in your family for Christmas? We decided to get him a high quality portable speaker. Something with Bluetooth connectivity and GREAT sound. Thanks to my work with Collective Bias, I was able get exactly what we were looking for! 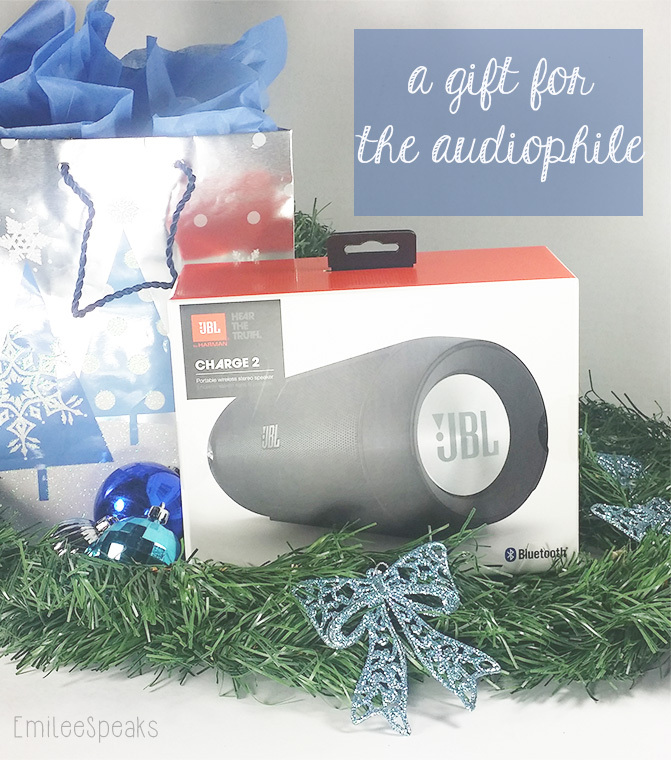 The Charge 2 portable bluetooth speaker by JBL is THE perfect gift for any audiophile. It has Bluetooth connectivity for wireless ease of use. Since you're more than likely to be using this speaker with your smart phone, it has a built in microphone for spearkerphone calls! This speaker really packs a punch of bass with passive radiators that you can see trembling. Another awesome feature is the social mode which allows up to 3 people to take turns playing from their own playlists! All of this with 12 hours of battery life. 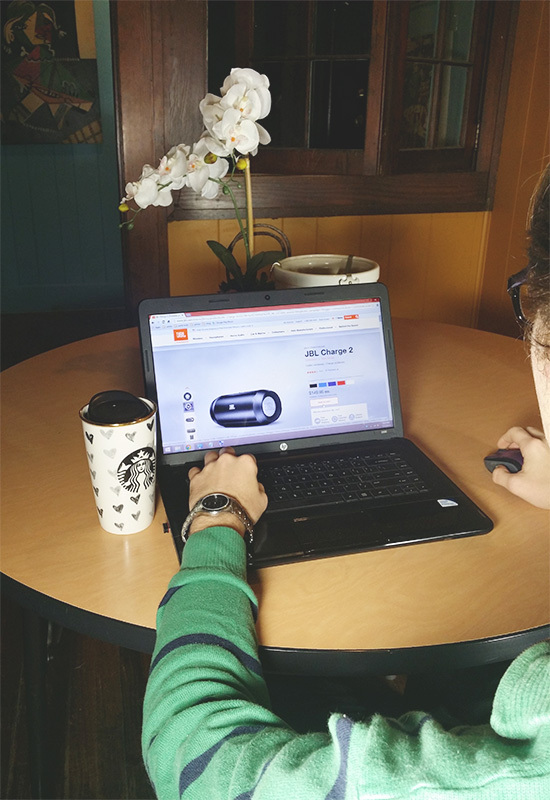 JBL makes your holiday shopping a breeze with their Holiday Gift Guide. 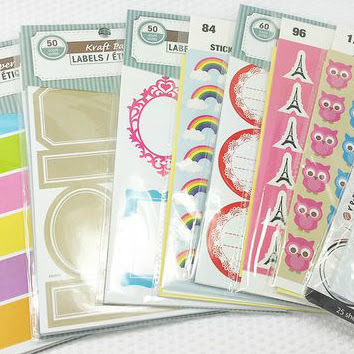 They have some fantastic options for anyone on your shopping list. Various items and various price ranges. With FREE shipping, 30 day returns, and lifetime support you can't go wrong. 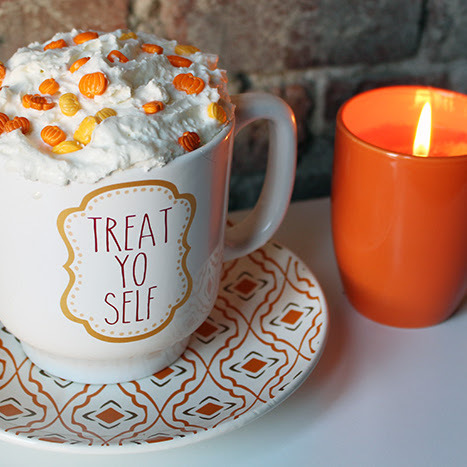 Plus, you can skip the crowds and shop from the comfort of your own home. We decided to let Christian have his Bluetooth speaker early so that we could enjoy it as a family while putting up the Christmas tree and other decorations. Yes that bizarre contraption on the left is my Christmas Tree. I proposed a design idea to my Father who is a jack of all trades, and he made it for me! I love my eclectic Christmas tree! 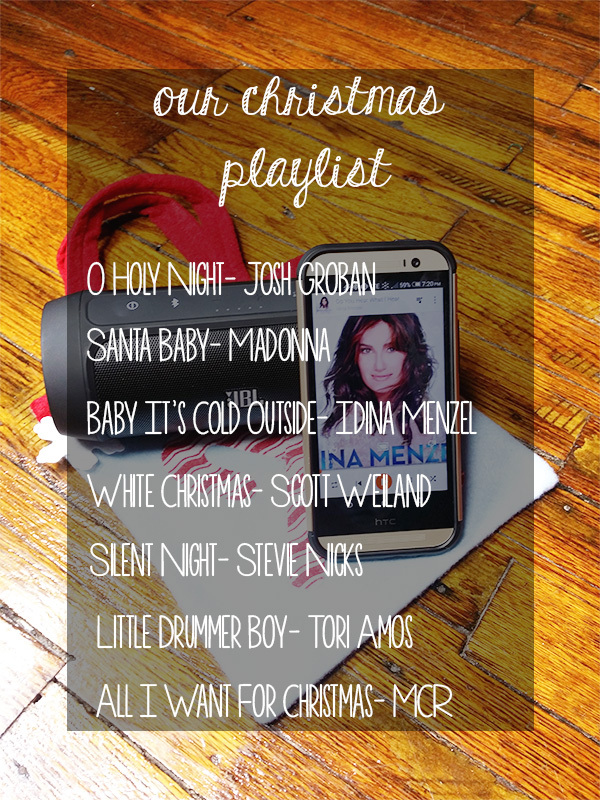 We each had a list of our favorite Christmas songs in varying genres and styles! 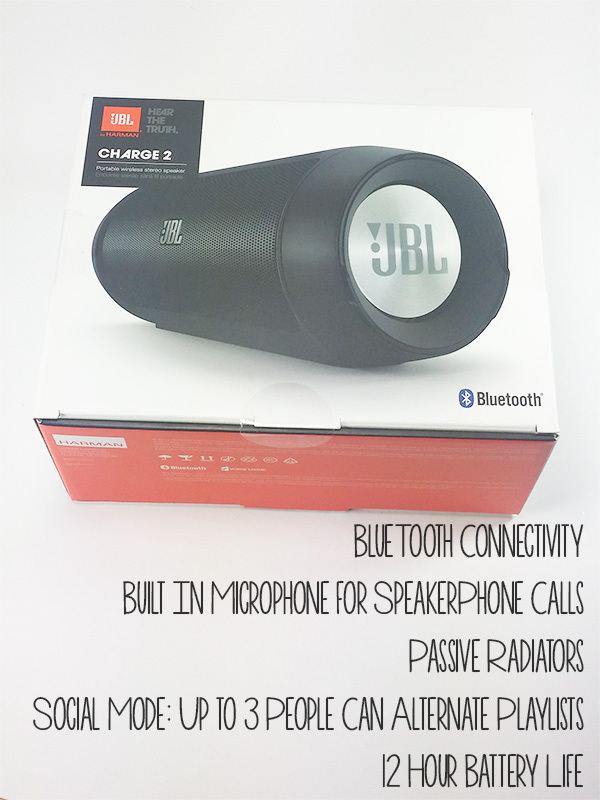 Utilizing the social mode on the Charge 2 Bluetooth speaker, we took turns with our playlists! The picture above is a sampling of some of the songs on our playlists. I told you... varying! Ahah! 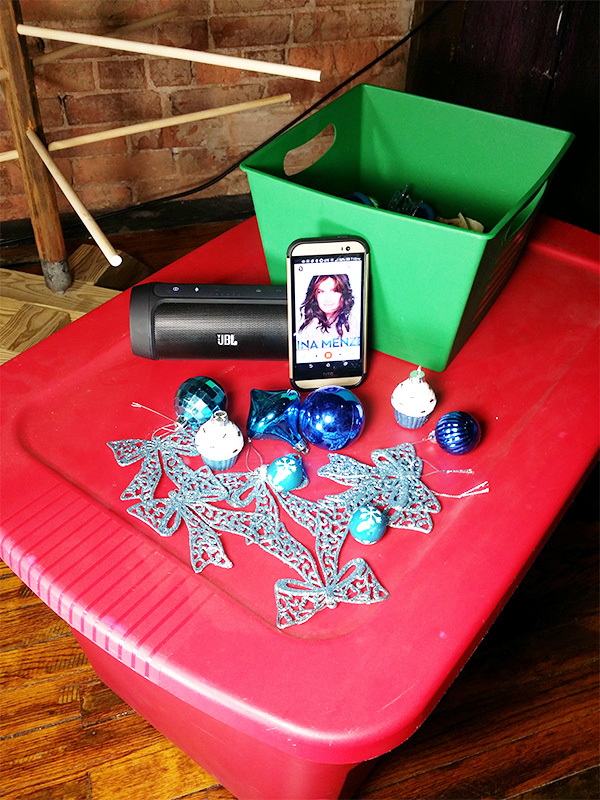 Decorating our tree and home for Christmas with the Charge 2 Bluetooth speaker thumping our favorites is a memory we'll never forget. Definitely the perfect Christmas gift for my not so little audiophile teenager. What a great gift idea. Portable speakers always come in handy. I like that you can alternate playlists for up to 3 people. Yes! It makes it really fun to socialize musically with other people! This is awesome. It's totally a great gift idea for anyone who loves music. I know a few people on my list that would love this. Love this, portable speakers are the best! Love that christmas playlist too, btw! This is a great speaker. A 12 hour battery life is pretty impressive. I thought so too! It really truly lasts a long time on one battery charge. I want one of these! This would make a Christmas gift to both give and receive! Yeah! They are so handy! It's the perfect size! Neatly tucks in anywhere out of sight. I have been hearing a lot of great things about this speaker! Now this is a great gift idea that all genders would enjoy. Thanks so much for the suggestion and for sharing. I love the look of that speaker. I really want one like this for when I'm cooking o cleaning the house. Perfect for playing some music to keep you motivated in the office! I love your playlist. It is very similar to mine! This speaker is awesome looking. This would be the perfect Christmas gift for my son. I will have to go and look at them in the store. My little sister has one. I have to admit they are pretty awesome! I should get one for my little brother. I love this speaker, I can't wait to use it this summer by the pool! My son loves to listen to music. He would love this without a doubt. The more I read about these, the more I like them. I could use a set for the basement I think then the kids could just have their dance parties without all the fuss of hunting for something that plays music. This looks like a great portable speaker. My kids are asking for one for Christmas. I will have to go pick one up. Wow that's really neat, this would be perfect for my teenage son! I have one and love it as well. My husband loves it too. I use mine in the bathroom while getting ready all the time. I entered this giveaway because I have never had one of these wireless speakers before, and it looks really nice. Would definitely make a nice gift for music lovers. I have a JBL speaker and absolutely LOVE it! They're so handy & portable! Everyone has these, I want one! I must have it. 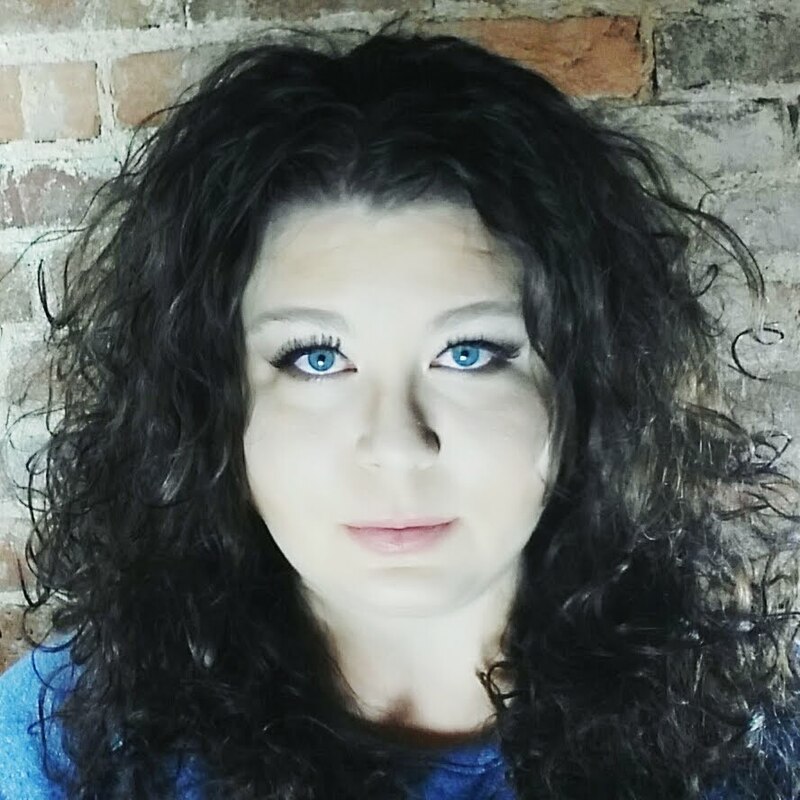 Thanks or hosting a giveaway for it. Have a wonderful week!